When the health or structure of a tooth becomes compromised, restorative dentistry treatments rebuild the strength of the tooth to restore oral functions. In most cases, restorative dentistry treatments are safe, effective, and minimally invasive. However, when damage is severe, more invasive techniques may be necessary to save the tooth. Root canal therapy is a perfect example of this. Root canal therapy eliminates tooth structure that has been damaged by a root canal infection, and restores a strong, functional tooth. Although root canal therapy successfully restores a tooth in most cases, many patients still have questions about this procedure, and whether tooth extraction is a better solution for root canal infection. Dr. Byron W. Wall is happy to discuss root canal therapy vs. tooth extraction with his Albuquerque, NM patients, and explain why preserving the natural tooth is always his first priority. Although most people would say they have heard of root canal therapy, few actually know what happens during treatment. Root canal therapy is performed to treat an infection of the nerves and tissues at the center of the tooth. Prior to treatment, the patient will be anesthetized to ensure that they remain comfortable throughout the procedure. When the tooth is numb, Dr. Wall will drill a small hole in the tooth. Through this hole, he will be able to remove all the tissues that have become damaged and inflamed by infection. After removing this material from the tooth, Dr. Wall will clean and disinfect the root canals of the tooth. Finally, the center of the tooth will be filled with a rubber-like compound. This compound preserves the structure of the tooth and seals off the roots of the tooth to block out bacteria. In most cases, Dr. Wall will complete treatment by placing a dental crown over the entire tooth. 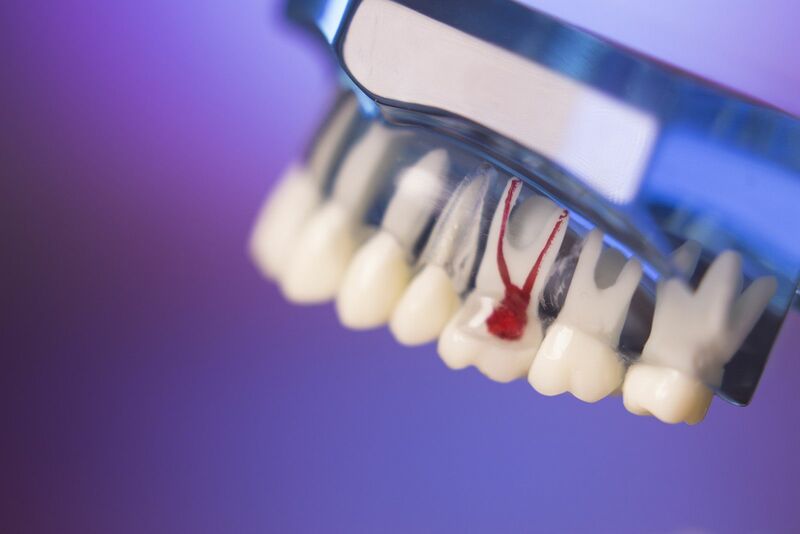 With a crown in place, the tooth will be even stronger, and further protected from re-infection. In a fairly short amount of time, root canal therapy is able to treat infection and restore a strong and fully functional tooth. Many people have heard scary stories about root canal therapy, but when performed by an experienced dentist such as Dr. Wall, it is a virtually painless procedure that prevents the need for tooth extraction. When a root canal infection is present, Dr. Wall will always consider root canal therapy as a first means of treatment, because it allows us to save the natural tooth. However, in rare cases, tooth extraction may be necessary. Tooth extraction may be recommended if the structure of the tooth has been damaged so extensively that even its root structure cannot be saved. If Dr. Wall does perform tooth extraction, it will be necessary to follow up the procedure with restorative dentistry treatment that replaces the missing tooth. If not, the entire strength and structure of the smile could be compromised. Root canal infection is a painful condition that compromises the health, strength, and function of the smile. If you would like to learn more about your options for treating a root canal infection, contact us at your earliest convenience. Dr. Byron W. Wall can examine your teeth and create a treatment plan that is best suited to your unique oral needs.